‘Quick acting’ is the meaning of the word Celeri, the Latin origin of the name Celery. Well identified as one of the prime ingredient of the Holy Trinity of Louisiana Creole and Cajun cuisine, Celery is a renowned herb known to the Chinese as early as the 5th century and was used in Indian Ayurvedic medicine earlier than that. Belonging to the Umbelliferae plant family, it is botanically called as Apium graveolens. Celery seed oil is obtained from the dried Celery seeds by the steam distillation method. Called as Ajamoda in Ayurveda, Celery seed have been used for thousands of years in treating neurological afflictions, poor digestion, influenza, water retention, high blood pressure, insomnia, arthritis, rheumatism, cold, flu, bronchitis, hepatitis, gout, stone formation in gall bladder or kidneys, asthma, arthritis, dizziness and other ailments related to spleen and liver. Well known to the contemporary world as a vegetable, Celery owes its nativity to the lowland of Italy and it gradually spread to other parts of the world like Egypt, Ethiopia, Algeria and India. It is often referred to its use in the New Kingdom of Egypt around 1000 B.C. Celery was held high as a sacred herb during the Greek era and was used in crowns by the athletes. Few sources state that Celery leaves were found in the garland of the tomb of Pharaoh Tutankhamun who died in 1323 BC. It is also mentioned in numerous classical works, one being Homer’s Iliad where the horses of the Myrmidons were said to graze on the wild Celery in Troy. Aulus Cornelius Celsus, the eminent Roman encyclopaedist well known for his invaluable work in the field of medicine has mentioned about the use of Celery seeds in pills for relieving pain, in his work De Medicina, which is the only existing section of the whole of encyclopedia. Celery seeds were used as a traditional remedy by Hippocrates and was globally used as an effective diuretic in treating cold, arthritis, flu and digestive disorders. The German Commission E prescribes Celery for treating gout, gastrointestinal problems, loss of appetite, exhaustion, weight loss from malnutrition and rheumatism and it was used in Britain in the 19th century for treating rheumatic conditions. The juices extracted from the petioles were used in the treatment of edema, rheumatic tendencies, gout, flatulence, overweight due to water retention and lack of appetite. Moreover the petiole which is crisp is also used as a vegetable worldwide. 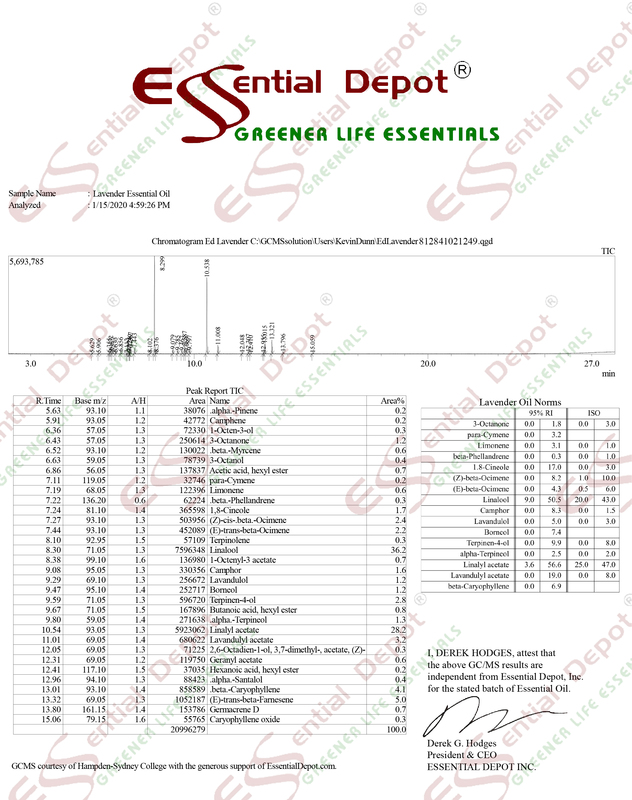 With limonene as the major chemical component Celery seed oil consist of a-p-dimethyl styrene, N-pertyl benzene , caryophyllene, a-selinene, N-butyl phthalide, sedanenolide, sabinene, b-elemne, trans-1 2-epoxy limonene, linalool, isovalaric acid, cis-dihydrocarvone, trans-dihydrocarvone, trepinene-4-ol, 1-cis –p-menth-2,8-diene-1-ol, trans-p-menth-2, 8-diene-1-ol, alpha-terpineol, luteolin, carvone, trans-8-diene 1-ol,perialdehyde, apiin and thymol. It also serves as an eminent nutritional supplement rich in Vitamin A, B, C & E, carbohydrate, protein, iron, potassium, water, fat, fiber, sodium, zinc, phosphorus, magnesium and calcium with traces of niacin, riboflavin and thiamine. The therapeutic properties of Celery seed oil are aphrodisiac, anthelmintic, antispasmodic, carminative, diuretic, emmenagogue, laxative, sedative, cardiac-stimulant, antiseptic, anti-emetic, diaphoretic, antifungal, anti-inflammatory, mosquitocidal, nematicidal, anti-bacterial, stomachic, nervine and tonic. Illness, aging and death are the three major problems of mankind and have been drawing the interests of medical experts, researchers, and philosophers from the entire universe for innumerable years. Ayurveda, the mother of all healing sciences on earth exists for more than 5,000 years and it uses natural remedies for attaining longevity through prevention of diseases and a disciplined lifestyle. Ayurvedic healing practices were recorded in the Vedic literature and Ayurvedic texts like Charaka Samhita and Sushruta Samhita. Charaka, known as the father of medicine has mentioned in his book Charaka Samhita that “The three – body, psyche, and soul – act as a tripod. The world stands upon them, and within them, the world abides.” This traditional remedial science robustly states that perfect health is a combination of physical, mental and spiritual wellness. The science of Ayurveda considers human body as a temple and associates the divinity with the soul that dwells within the body. According to this ancient system, everything in the universe is a part of nature and is made up of the five elemental forces of nature, namely fire, water, air, earth and space. Every individual is a unique creation with a unique individual constitution that holds three vital biological energies known as doshas. These energies are just a consequential depiction of the elements of nature. Vata energy is an arrangement of air and space and is accountable for circulation, respiration and movement and vitiation of vata dosha causes breathing difficulties, neurological problems, nervous disorders, and menstrual discomforts. Fire and water come together to embody Pitta dosha, which is in charge of metabolism and body temperature. Excess or deficit of pitta dosha might end up in constipation, fever, ulcer, indigestion, heartburn and other digestive disorders. Kapha energy stands for earth and water and is responsible for the physical structure, movement of fluids and sustenance of the body. Surplus or deficiency of kapha dosha leads to sluggishness, obesity, respiratory problems, rheumatism and inflammatory conditions. Ayurvedic philosophy states that the balance between these three doshas according to their natural composition contributes to well-being and imbalance of any one or all the three doshas causes sickness. Ayurvedic remedies focus on treating the doshic imbalances with the help of essential oils, yoga, herbs, meditation, Ayurvedic routine, Ayurvedic massaging or Abhyanga, prayers, Panchakarma or detoxification techniques and simple physical exercises. These remedies differ from individual to individual on the basis of their unique individual constitution and medical conditions. Celery seed oil with its hot, easy, light, pungent and dry properties is known for increasing pitta and vata dosha and for pacifying kapha types. Surplus of kapha energy is responsible for water retention, stagnation of fluids, salt, toxins, uric acid, bad cholesterol and fat in the body. 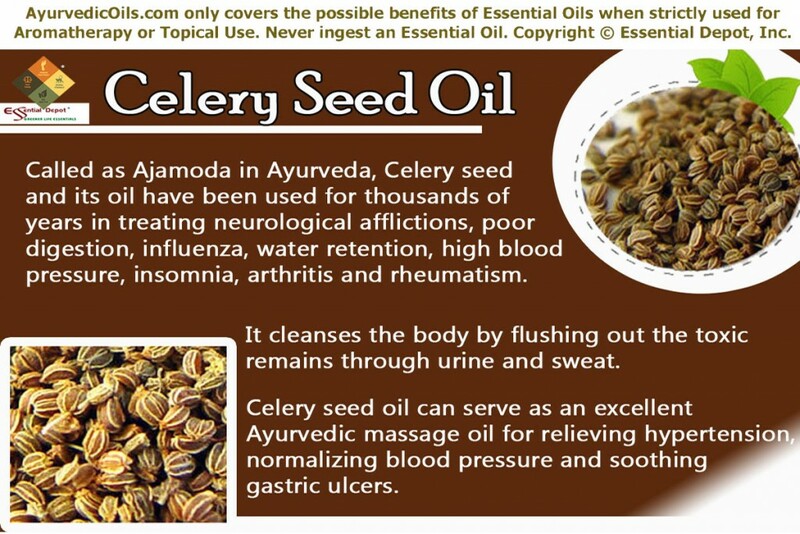 Celery seed oil is a promising Ayurvedic remedy for pacifying kapha dosha and thus it helps in eliminating toxins and other excess fluid deposits stagnated in the body through urine and sweat. Along with this, the presence of Phthalides such as 3-n-Butylpthalide makes Celery seed oil as a potent diuretic that aids in flushing out toxins and fluid retention from the system and alleviates the symptoms of bloating. As a natural stimulant, it stimulates the kidney to function actively in discharging excess water along with uric acid, fatty acids and other harmful substances that pave way to the formation of kidney stones, gravel and bladder stones. Dirt or toxic deposits even in a smaller proportion in the system can result in malfunctioning of both the internal and the external organs. Liver plays a major role in eliminating the toxins from the body and is often prone to get affected seriously if the level of toxins is high. 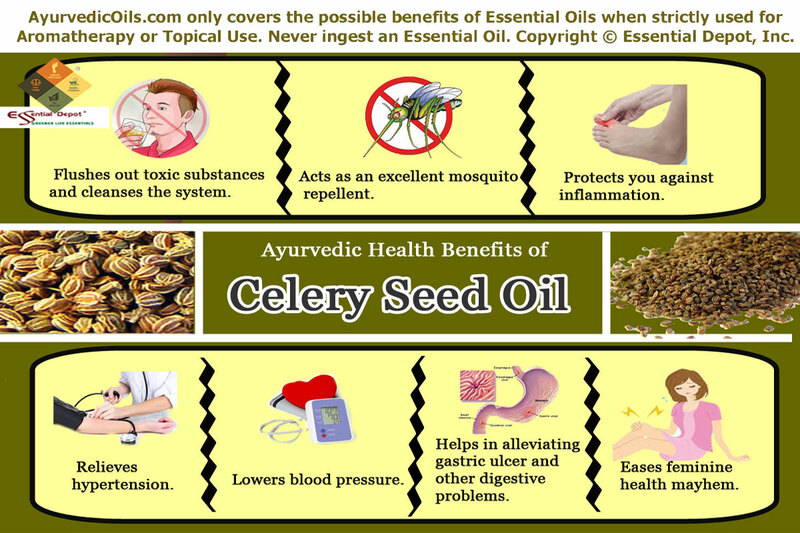 Celery seed oil is liver friendly and protects it against the harmful effects of acetaminophen (Tylenol) found in pain relievers, which are extremely poisonous when present in large amount and other hazardous particles. Rheumatism is often a kapha imbalance caused due to the amassing of toxins, excess fluid, uric acid, salt and fatty acids especially in the joints. Massaging the affected parts or your entire body with 20 drops of Celery seed oil blended with 10 ml of coconut oil can assist in decreasing water retention, uric acid, toxins and other harmful particles in the system, thus helpful in the treatment of inflammation, overweight, rheumatoid arthritis, kidney infections, liver disorders and hypertension. Mosquitoes often act as vectors for numerous infectious viruses and parasites. With its mosquitocidal, nematicidal and antifungal compounds such as sedanolide, senkyunolide-N and senkyunolide-J, Celery seed oil acts as a tremendous mosquito repellent. Many studies have revealed that Celery seed essential oil emitted strong repellency activity against wide range of mosquitoes belonging to various genera some of which are Aedes gardnerii, Aedes lineatopennis, Armigeres subalbatus, Culex tritaeniorhynchus, Cx. vishnui group, Cx. Quinquefasciatus, Mansonia uniformis and Aedes aegypti – the vector of yellow fever, dengue fever and chikungunya. Celery seed oil exhibits larvicidal and adulticidal repellent activities against Aedes aegypti which was identified by the toxic effect of this oil in the nervous system of the mosquito producing an abnormal movement in the larvae. This attribute makes this oil to be the safe and natural mosquito repellent than most other commercial repellents in the market. Applying 2 drops of Celery seed oil blended with 1 ml of jojoba oil or your skin care cream or lotion on your skin can act as a protective shield against mosquitoes and guard you from mosquito-borne pathogens such as dengue, malaria, filariasis and tularemia. It is proven to be safe on human beings with no dermatological side effect during the course of research on the human volunteers. Celery seed oil is a natural remedy for inflammation associated with pain and discomfort, be it an acute or a chronic one. With apiin as one of its major component, it possesses anti-inflammatory, immunomodulatory and kapha pacifying properties in-charge for inflamed conditions. Apiin has the potential of inhibiting the production of nitric oxide that acts as one of the inflammatory mediators. Chemical components such as luteolin, limonene, apigenin, phthalides and coumarin possess very strong anti-inflammatory properties that help in fighting against inflammation in any part of the body and assist in reducing the risk of ailments such as heart diseases and cancer. This attribute along with the diuretic property of Celery seed oil helps in recovering from the symptoms of gout and rheumatoid arthritis as mentioned by Michael T. Murray and Joseph E. Pizzorno in their book “The Encyclopedia of Healing foods”. Celery Seed oil proves beneficial in dealing with the discomfort and degeneration the body joints due to aging. Gentle massage with 5 drops of Celery seed oil mixed with 2.5 ml of olive oil is recommended to ease the pain in joints due to arthritis and this also aids in retaining healthy joints. Adding 3 drops of Celery seed oil in warm bathing water or in foot bath also helps in reducing the inflammation in the urinary tract and as a natural anti-fungal agent it destroys and inhibits the growth of Candida albicans that cause oral and genital infection in humans, for which this is used as an active ingredient in many urinary antiseptic products. 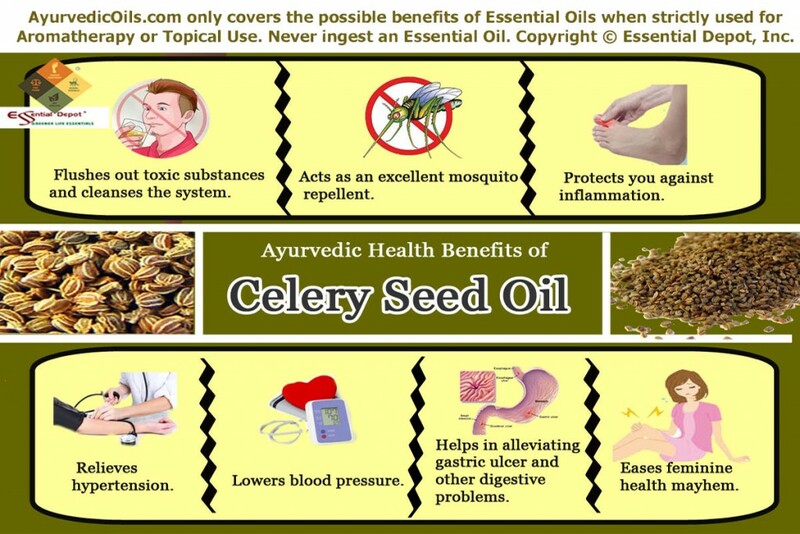 Celery seed oil serves as a natural vasorelaxant and anti-hypertensive agent that protects one from the risk of developing some fatal diseases associated with hypertension. Few among them are diabetes, endothelial dysfunction, renal dysfunction, congestive heart failure, metabolic syndrome, coronary artery disease and stroke. The presence of chemical components such as apigenin, luteolin, kaempferol, caffeic acid, ferulic acid and coumaric acid instill a relaxant effect in the central nervous system and helps in lowering hypertension. Owing to its nervine qualities, Celery seed oil is vastly employed in treating nervousness, depression, anxiety and tension. It also serves as a wonderful antidote for alcoholism. With limonene acting as a mild tranquilizer, Celery seed oil works wonders with insomnia and addiction to alcohol or drug usage. Massage your system with 10 drops of this oil blended in 5 ml of almond oil, followed by a warm bath diluted with 3 drops of Celery oil and 2 drops added to diffuser to relieve hypertension and grant absolute relaxation. Celery seed oil contains apigenin and isoquerticin that aid in lowering the blood pressure by stimulating the expansion of blood vessels. The combination of several active components such as flavonoids, volatile oil, coumarins and linoleic acid contributes to the anti-oxidant property of Celery seed oil. This helps in protecting the cells from being damaged and purifies the blood resulting in lowering the blood pressure and controlling the level of bad cholesterol in the blood. Adding 3 drops of Celery seed oil in warm bathing water and inhaling the tranquilizing aroma of this oil by adding 2 drops to your burner, vaporizer or diffuser can serve as a potent aid for lowering blood pressure. The essential oil of Celery seed has excellent pitta increasing properties that stimulate Agni or the digestive fire responsible for trouble-free metabolic functions. This contributes to the stomachic and anti-ulcerogenic attributes of Celery seed oil, which imparts a soothing effect on the digestive system and assists in alleviating flatulence, indigestion, heartburn and poor appetite. As a natural source of organic sodium, Celery seed oil is much protective in forming a defensive shield for the lining of the stomach and intestines. A 2010 research on the gastric anti-ulcer activity of Celery seed in rats states that the Celery extracts rich in flavonoids and alkaloids protected the stomach by protecting the gastric mucosa and suppressing the basal gastric secretion. Moreover Celery essential oil is an antimicrobial agent that possess strong inhibition against bacteria such as Escherichia coli and fungus such as Candida albicans thus protecting the intestines from the infectious microbes and parasites. Massaging your abdomen with 3 drops of Celery seed oil with 1.5 ml coconut oil can help in improving metabolism. 2 drops of this oil added to diffuser or burner can help in enhancing the appetite and 2 drops added to 1 cup of warm water can be used as a gargle for curbing oral infections and killing parasites and microbes in the stomach and intestines. Celery seed oil is in rich vitamins and minerals that help in regulating the flow of blood all over the body and assists in strengthening the muscles of the uterus. It helps in stimulating uterine contraction and induces menstruation, while reducing the pain and discomforts associated with it. This oil also regularizes the monthly menstrual cycle. Being a rich source of calcium, Celery seed oil helps in the maintenance of healthy bones and teeth and aids in proper muscular contractions and alleviates the adverse impacts of osteoporosis after menopause. 5 drops of Celery oil mixed with 2.5 ml sesame oil can be massaged gently on your lower abdomen, genital parts and thighs for promoting delayed or blocked menstruation, reducing pain, treating menopausal problems and lessening fatigue and mood swings associated with menopause and menstruation. Few studies also state that Celery seed oil may reduce the risk of ovarian cancer and breast cancer with its antioxidant properties. It helps in balancing the acid/ alkaline system in the body and aids in preventing cancer by reversing the effect of free radicals and inducing apoptosis in case of gastric, liver, colon, cervical and prostate cancer cells of human beings. 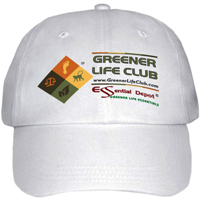 Celery seed oil acts as an aphrodisiac in stimulating the secretion of sexual hormones. Due to its sweet and earthy aroma it is often used in salads, soups and sauces. It is also employed in skin care to treat acne, scars and boils and in treating acute headaches, cold, flu, pyorrhea, anemia, mental stress, sleeplessness etc. Due to its antibacterial, antifungal and mosquito repellent properties, this oil is used in the manufacturing of disinfectants, antiseptic creams and lotions, mosquito repellent creams, soaps and perfumes. This article is only for the purpose of education and is not proposed to treat, prevent or make a diagnosis of any ailment or medical condition. Nor is it meant to substitute any prescribed medication or professional medical advice. We are not medical professionals and this information is only for the purpose of enlightening the readers with the ancient wisdom or knowledge of life known as Ayurveda. Do not take essential oils internally and always use them in a diluted manner for topical use, as organic and pure essential oils are highly concentrated substances. Keep out of reach of children and it is always good to do a small patch test on your skin with the diluted essential oil. Pregnant women are not advised to use this oil as it stimulates and contracts the uterus and may result in miscarriage. Consult your healthcare expert or your Ayurvedic practitioner before choosing the right essential oils for your medical condition and prakriti or unique individual constitution. The Healing Intelligence of Essential Oils: The Science of Advanced Aromatherapy by Kurt Schnaubelt Ph.D.